Shop ‘til you drop, then relax in comfort. Book today and receive a $25 gift card valid anywhere at the Potomac Mills shopping mall. Radisson RewardsTM members will also earn points for their stay. Not a Radisson Rewards member? Join now. 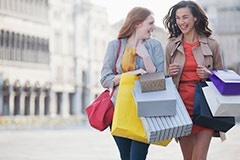 The Country Inn & Suites® by Radisson, Potomac Mills Woodbridge, VA is conveniently located just blocks from the Potomac Mills Mall, which features outlet shopping, over 100 stores and multiple restaurants. From housewares and home furnishings to designer fashions for adults and children, this hub has something to offer for all your shopping needs. Whether you're in town for back-to-school shopping, Black Friday or Christmas, our hotel offers the perfect location near the Potomac Mills stores you love! This offer is available for stays through December 31, 2019. Promotion may not be combined with other discounts or promotions.